The turbine entry temperature in a gas turbine (Brayton) cycle is considerably higher than the peak steam temperature. 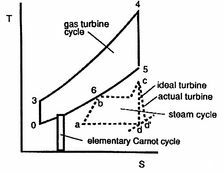 Depending on the compression ratio of the gas turbine, the turbine exhaust temperature may be high enough to permit efficient generation of steam using the ``waste heat'' from the gas turbine. A configuration such as this is known as a gas turbine-steam combined cycle power plant. The cycle is illustrated in Figure 8.18. 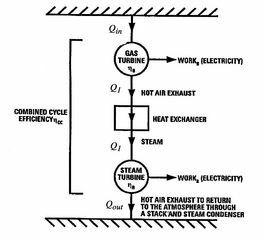 The heat input to the combined cycle is the same as that for the gas turbine, but the work output is larger (by the work of the Rankine cycle steam turbine). A schematic of the overall heat engine, which can be thought of as composed of an upper and a lower heat engine in series, is given in Figure 8.19. The upper engine is the gas turbine (Brayton cycle) which expels heat to the lower engine, the steam turbine (Rankine cycle). where the subscripts refer to combined cycle (CC), Brayton cycle (B) and Rankine cycle (R) respectively. Equation (8.5) gives insight into why combined cycles are so successful. 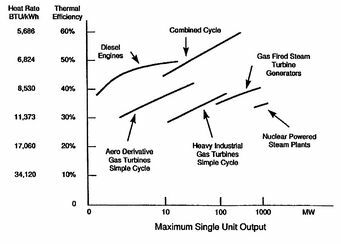 Suppose that the gas turbine cycle has an efficiency of 40%, which is a representative value for current Brayton cycle gas turbines, and the Rankine cycle has an efficiency of 30%. The combined cycle efficiency would be 58%, which is a very large increase over either of the two simple cycles. Some representative efficiencies and power outputs for different cycles are shown in Figure 8.20.